BANGLADESH, formerly the East Wing of Pakistan, emerged as an independent nation in December 1971. The exclamation on the occasion--"Joi Bangla! Joi Bangla!" (Victory to Bengal! Victory to Bengal!) was a collective and plaintive cry following a particularly bitter and bloody struggle for freedom. These words echoed the cultural and ethnic disposition of the new state--in short, the ethos of the people--that Bangladesh was to be a culturally and linguistically cohesive unit. Pakistan itself had been created on August 15, 1947, largely the result of communal passions pitting Hindus against Muslims. Pakistan was divided into two wings, separated by 1,600 kilometers of Indian territory, with Islam only a tenuous link between the two wings. Of paramount importance to East Pakistanis was the Bangla (before 1971 usually referred to as Bengali) language and culture, a consideration not appreciated by the West Wing of Pakistan until it was too late. When Bangladesh joined the community of nations, it was at first recognized by only India and Bhutan. With its fragile and underdeveloped economic infrastructure under extreme duress, its law and order situation challenged by numerous well-armed contingents of unemployed former freedom fighters, its impoverished population agitated by the unfulfilled promise of rising expectations, Bangladesh was, in international circles, given the unfortunate label of "international basket case." 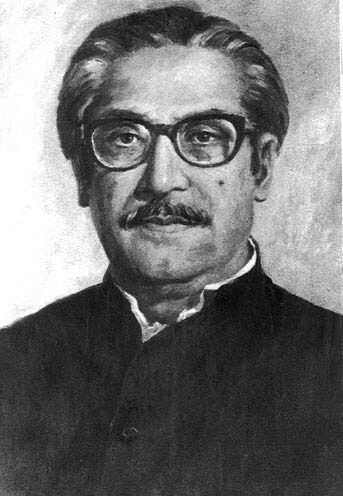 Bangladeshis rejoiced at their attainment of independence and offered their adulation to the first national leader of Bangladesh, Sheikh Mujibur Rahman (Mujib), or the Bangabandhu, the "Beloved of Bangladesh." Yet the future of Bangladesh, envisioned by the Bangabandhu and enshrined in the 1972 Constitution as nationalism, socialism, secularism, and democracy, was as uncertain and ephemeral as the Bengal monsoon. In 1975 Mujib, by then discredited for presiding over a bankrupt and corrupt regime, was assassinated along with most of his family. In the ensuing years, a number of regimes rose and fell in the violent legacy of Bangladeshi politics. Authoritarian and military rule has dominated the short history of Bangladesh. But Bengali society is known for its mercurial politics, and popular demands for a more open government in Bangladesh, while under control in the late 1980s, continued unabated.